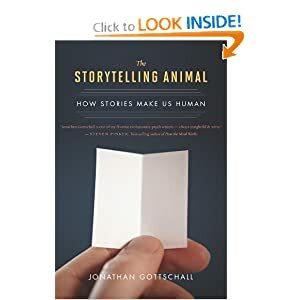 The Storytelling Animal: How Stories Make Us Human, by Jonathan Gottschall, Houghton Mifflin Harcourt, Boston, MA. “Humans are creatures of Neverland? Neverland is our evolutionary niche, our special habitat. We are attracted to Neverland because, on the whole, it is good for us. 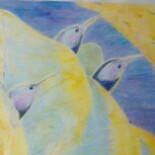 It nourishes our imaginations; it reinforces moral behavior; it gives us safe worlds to practice inside. Story is the glue of social life–defining groups and holding the together. We live in Neverland because we can’t not live in Neverland. We are the storytelling animal.” P 177.
and in that, there is room for dog dreams about rabbits and cats about dogs. As social animals, we can benefit from others’ experience and explore potential outcomes of different actions. Interestingly, he cites research showing that people who are avid readers of fiction actually possess better social skills; having explored different characters minds, they have greater empathy. Violent stories lead to more violent behavior while pro-social characters lead to collaborative behaviors. Our stories are categorically moral. Even those where the protagonist is the bad guy, the endings show the consequences of anti-social behavior. Bonnie and Clyde; Butch Cassidy and the Sundance Kid; they all come to a bad end. Much of the night we dream stories. How could it help a species to paralyze it and show it scary movies most of the night? For dreams are mostly about trouble, showing us on average 5 scary episodes per night. While we tend to remember the most fantastical dreams, the worst nightmares, most dreams are fairly realistic. They give us practice in resolving the big dilemmas of life, acting as flight simulations to above the potential crashes in life. But our penchant for tying circumstances together in story is not an all-together benefit. In an attempt to find meaning, we sometimes invent conspiracy theories and demonize others not of our tribe or religion. And the stories we tell ourselves about our own lives –our memories–are as fictional as our dreams. We edit our life story to make our own protagonist better fit our hopes and dreams. This entry was posted on November 12, 2013 by axisperformanceadvisors in Book Reviews and tagged Communication, Human needs, Storytelling.